This sculpture on the corner of South Elm and East Gate City Blvd streets actually functioned as an air compressor on a U.S. Navy ship before it was transformed into a public art landmark in Downtown Greensboro. The 5,000-pound compressor donated by John Tasker Jr. was painted originally to represent a globe and completed with an iron “Greensboro” welded over the sculpture. The Planet Earth project was spearheaded by Sidney and Ricki Gray, a couple who live and breathe Greensboro. Martha Forrest was instrumental in bringing this project to fruition. With a donation from The Old Greensborough Preservation Society the Grays spent their own money to build the stone base, rent a sandblaster, and buy paint, while artists Tony Forrest and sculptor Erik Beerbower donated their services. 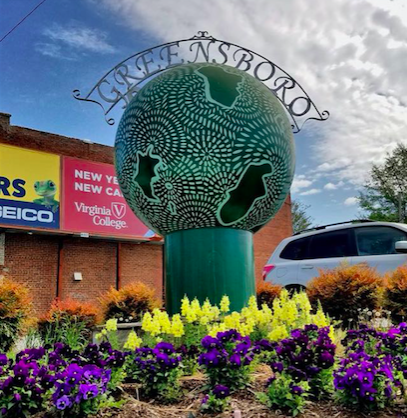 This globe, marking the center of the growing South Side area, is a testament to the success of collaborative and generous efforts from each of these Greensboro residents and natives.